Sociocultural: The learners in this study were 7th grade science students with the age range of 12-13 years old. Some students live at home with both parents and some students live in between their two parents homes. The students have access to technology at school and at home. At school, students have access to chromebooks in every classroom. Most students have a smartphone and also access to a tablet or computer at home that is connected to the internet. They spend a lot of their free time on social media applications such as instagram and snapchat, where they share images and messages with many of the students at our school. They spend time on Youtube and other streaming services such as Netflix. They follow celebrities online and follow their favorite social media personalities. They are motivated by attention and recognition (likes and follows) by their peers on social media. Studenst are also motivated by competing with their peers in online video games and “likes” on social media. ​Technical: The middle school students in this study are skilled at using technology. Students are able to operate a chromebook or smartphone with ease. They learn how to use new programs quickly. The students are skills at google tools on the chromebook such as Google Slides, Docs and Drawings. Students know how to search for information online including images and videos. Middle school students can read informational text found online and understand the content. Students are also proficient at submitting their classroom work digitally through programs like Google Classroom. Students know how to share documents and collaborate on a document with their classmates, as well as leave comments for their classmates. Informational: Learners currently have prior knowledge of how to post digital media for their peers through their use of social media. They also know how to look through posts that other students have created. An area that needs to be improved is their ability to give constructive feedback to their peers digitally. Students also need to know how to utilize feedback provided by their peers to reflect on their learning. Informational screencasts created by the instructor and an opportunity for students to practice these skills within the content of their science class will help them to master how to give peer feedback. 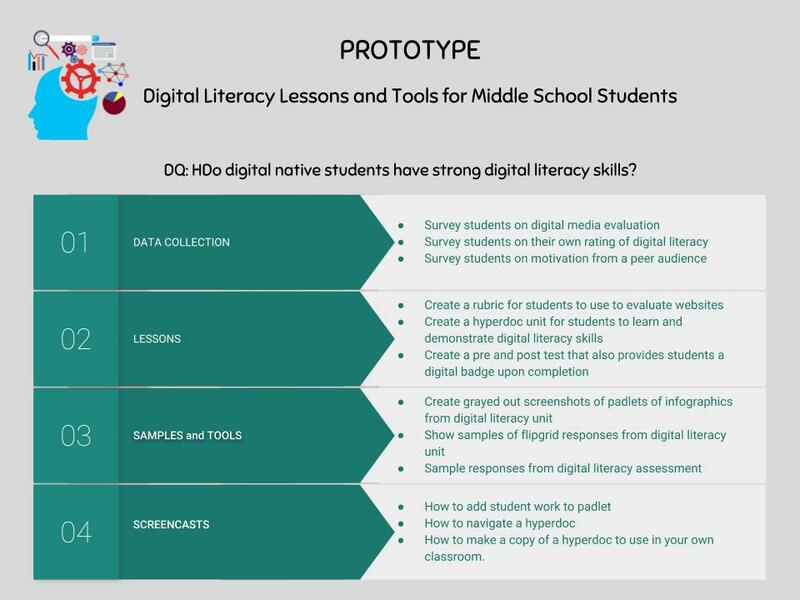 The video below was designed to review all of the digital tools used to motivate students during my digital literacy unit as well as other units in my 7th grade science class. I wanted to create a logo that was really simple and clean. I liked the color of blue because I learned in one of my classes that this was a color that represents "trustworthiness." I also wanted to show something that demonstrated how digitally connected our students are in today's classrooms. Below is a collection of images I liked as I started designing my final logo. Below is the final version of my logo for this capstone website. I designed the logo using Canva. The icon represented how digitally connected our digital native learners are. Our students are more connected than ever to technology. I felt that this image represented digital learners and digital literacy really well. My final version of my logo can be found below.